The new Wolverine EPS is ready to tackle tough terrain with confidence inspiring off-road capability and unmatched reliability. Off-Road Capability and Awesome Value: The Wolverine® EPS features an aggressive, compact look and is designed to provide the best blend of capability and value in the side-by-side segment, thanks to Yamaha’s blend of suspension, handling, drivetrain and chassis components working together to give you the ability to traverse rough terrain with confidence and comfort. Independent Double Wishbone Suspension: Wolverine EPS features a class-leading four-wheel independent suspension with long-stroke KYB® shocks that provide quality damping feel, reliable bottoming resistance, and preload adjustability to handle a wide range of riding styles, loads and terrain. Roomy, Comfortable Cabin: Comfort is maximized for both the driver and passenger with an automotive-style cab and driving position featuring supportive seats with dedicated headrests, 3-point seat belts, an adjustable passenger handhold and roomy floorboards that provide a comfortable driving experience. High-Tech DOHC Engine: The Wolverine EPS is powered by Yamaha’s newest and most advanced 700-class engine ever, with dual overhead cams and fuel injection. The 708cc engine's power character is optimized for smooth, linear, power delivery to tackle both open trails and more technical terrain. Yamaha’s Unique Ultramatic® CVT: Yamaha’s Ultramatic® continuously variable transmission (CVT) provides smooth power delivery, dependable all-wheel engine braking and incredibly reliable operation, for worry-free performance at work-or at play. On Command® Four Wheel Drive: Wolverine EPS features On-Command®, the industry’s most capable four wheel drive system. With a simple twist of the dial, drivers choose 2-wheel drive, 4-wheel limited slip, or 4-wheel full differential lock, enabling the Wolverine to claw its way through just about anything. 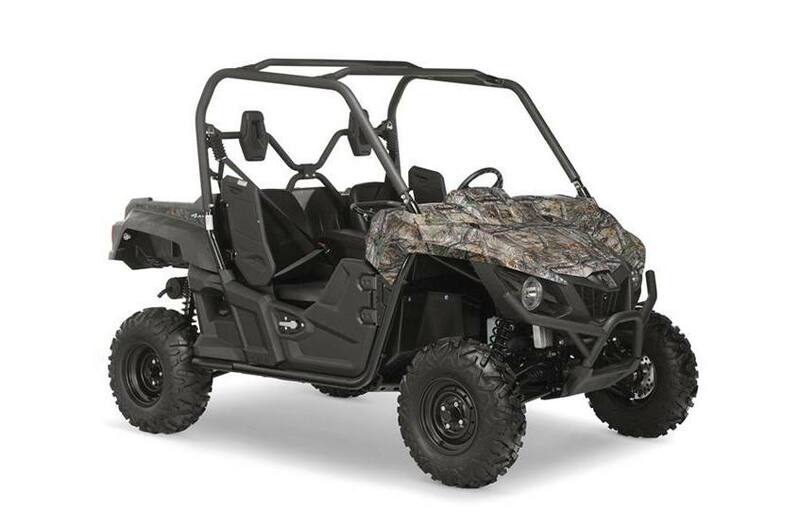 High-Tech DOHC Engine: Powered by a double overhead cam (DOHC), 4-valve, fuel-injected 708cc engine, the Wolverine EPS is tuned to optimize torque, power delivery and engine character to get through even the most challenging off-road terrain. Yamaha’s Unique Ultramatic® CVT: Ultramatic® fully automatic transmission with high, low, reverse and neutral provides the industry’s most durable CVT transmission. The one-way sprag clutch produces the industry’s most natural-feeling all-wheel engine braking and eliminates "freewheeling" found in some competitive models. A centrifugal clutch maintains constant belt tension and eliminates slipping, reducing belt wear and improving durability. On Command® Four Wheel Drive: On-Command® puts the driver in control of 2WD, 4WD or 4WD full diff lock with a conveniently mounted and easy-to-use dash-mounted dial. High Volume Intake: High-volume air intake optimizes power character for off-road situations and it is tucked under the hood to keep it out of the elements. The over-sized foam air filter is reusable and accessible without tools. Smart Serviceability: Gear, coolant and engine oil drain holes have been designed into the full-length skid plates which make maintaining and servicing the Wolverine EPS very convenient. Compact, High Visibility Design: The front and rear of the chassis-approach and departure angles-are tapered on the sides and bottom of the vehicle to reduce potential contact on tight trails and in rough terrain. With an 81" wheelbase and 11.4" of ground clearance, the Wolverine EPS is designed for best-in-class terrainability, while the body design and low hood gives drivers maximum visibility to navigate tight, technical trails and challenging terrain. Full-Length Skidplates: The Wolverine EPS chassis is optimized to conquer tight, difficult terrain. The class-exclusive full underbody skidplates lets it glide over many obstacles that might hold others back… and those skidplates are swept up more than two inches on each side to maximize clearance at the wheels. 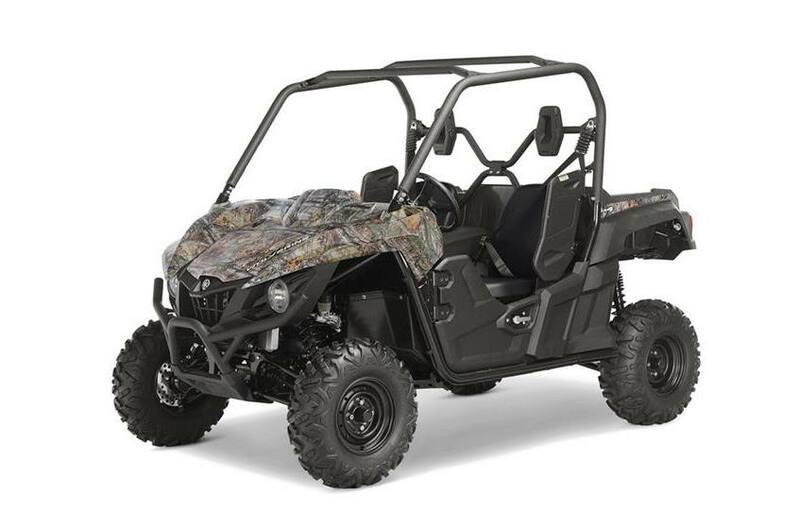 Power Steering: Yamaha’s proven electric power steering system on the Wolverine EPS offers excellent handling over all kinds of terrain, with lower steering effort for reduced fatigue after a long day in the field. Long Travel Suspension: Oil and nitrogen gas KYB® shocks with 9.7" of travel in the front and 10.6" of travel out back deliver excellent suspension and occupant comfort when hitting the trails, along with 5-way adjustable preload to handle varying loads. Off-Road Ready Chassis: Front wide-arc A-arms and full-length skid plates maximize durability, terrainability and provide 11.4" of ground clearance. Flares on the frame protect the rear wheels from oncoming trees and rocks. Exclusive 26-inch Maxxis® Bighorn® 2.0 tires provide optimum traction, durability, comfort and steering precision. Secure, Durable Braking: Large diameter front and rear wheel disc brakes provide unsurpassed stopping power with twin pistons for excellent, and predictable, overall brake feeling. Drilled rotors increase cooling and reduce noise, plus the wet parking brake is completely sealed, so it’s protected from the elements and virtually maintenance-free. Heavy-Duty Cargo and Towing Capacity: The Wolverine EPS’ tough, molded composite bed is rated to haul 300 pounds of gear, with six steel tie-down hooks to secure cargo. A standard, heavy-duty two-inch receiver-style hitch can tow up to 1500 pounds. Supportive Ergonomics: Comfortable seats with dedicated headrests provide great support and they’re positioned for optimal visibility. The driver’s seat is 3-position adjustable, too. Roomy Cab: Class-leading legroom, and a tough, textured floor surface make it easy to find a comfortable position whether you’re driving or passenger. Comfort for the Roughest Trails: Three-point seat belts, shoulder bolsters and an adjustable passenger handhold add to the comfortable feeling inside the cabin. Tough, rotomolded doors help keep mud, water and dirt on the trail where they belong. Extensive Standard Storage: Two cup holders, two center console storage bins and a dash- mounted glove box provide maximum space for storing items in the cab. Ready to Work: Standard 12V DC outlet in cab for powering accessories and personal items on the trail. High Volume Fuel Tank: Large, 9.7-gallon fuel tank allows for longer trips without refueling. L x W x H: 116.9 in. x 60.6 in. x 74.2 in. Fuel economy estimates are based on US EPA exhaust emission certification data obtained by Yamaha. Your actual mileage will vary depending on road conditions, how you ride and maintain your vehicle, accessories, cargo and operator/passenger weight. Wet weight includes the vehicle with all standard equipment and all fluids, including oil, coolant (as applicable) and a full tank of fuel. It does not include the weight of options or accessories. Wet weight is useful in making real-world comparisons with other models. Professional driver on closed course. Always protect the environment and wear your seat belt, helmet, eye protection and protective clothing. Read the owner's manual and the product warning labels before operation.